Acupuncture for TMJ Pain – Feeling jaw pain in Oakville? Waking up with headaches that your physio can’t fix? Has your partner told you that you grind your teeth at night and all of Oakville can hear it? Do you experience clicking or locking of your jaw? If you answered yes to any of these questions, it sounds like you’re experiencing TMJ pain. Our chiropractors at Nottinghill Family Wellness in Oakville can help! TMJ and JAW PAIN treatment in Oakville! What causes TMJ pain? A trauma to the jaw (a dodgeball to the face in gym class? A car accident? ), people who clench their teeth (lots of us do this when we’re stressed!) or a muscle imbalance between the right and left sides of the jaw can all result in jaw pain. The most effective treatments for TMJ pain are the ones that affect the joint directly. 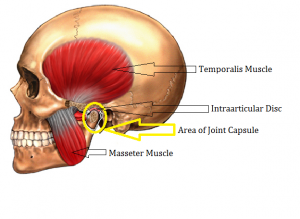 The joint capsule, the disc inside the joint and the muscles we use to chew (because they attach in and around the jaw joint) are the most common causes of pain in this area. One excellent option for treatment is acupuncture. Acupuncture in the jaw?! Yes – and it doesn’t hurt at all. Jaw pain is often due to tension in the muscles that attach around the jaw joint. Acupuncture is extremely effective at helping to reduce muscle tension and decreasing inflammation, which helps the jaw move more freely. Acupuncture has the ability to get inside the joint and muscles and therefore it doesn’t only treat symptoms – it treats the root of the problem! There are two acupuncture points in particular that can be extremely effective at helping to resolve this type of pain. One point goes right into the joint (painlessly) and the other targets a large jaw muscle that we use for chewing. It might sound weird to have needles in these areas, but they are all safe and pain-free. Our chiropractor has been trained extensively in anatomy to ensure that the needles are inserted into the correct areas. Your TMJ pain can be caused by grinding your teeth at night and it may be the reason you’re waking up with headaches. Acupuncture can help you with those as well! There are multiple points in the head, neck and back of the shoulders that are great for relieving muscle tension and alleviating headache pain. Come visit us at Nottinghill Family Wellness Centre for acupuncture treatment! Combining acupuncture treatment with jaw adjustments and muscle release therapy has proven to be an excellent treatment plan and your pain will be gone in no time!